In the German version of The Million Pound Drop Live, called Rette die Million!, candidates were asked for another name of juniperus virginiana (Virginische Wacholder). 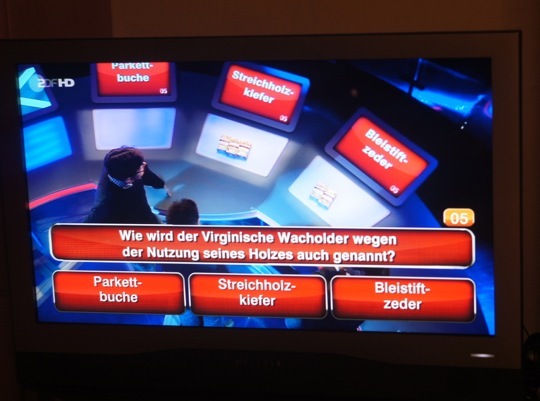 The correct answer was pencil cedar (Bleistiftzeder). The candidates lost more than half of their money on this question. Great to see something pencil related on prime time telly! …taking photos of TV shows is so much better on my mother’s flat screen compared to our CRT at home2. More about juniperus virginiana in the blog post Schwanberg and the Pencil Cedar. The photo of the pencil has been taken from the ZDF TV show ‘Rette die Million!’. I believe that the use of this image falls under “fair dealing” as described by the UK Copyright service.